Chicken 65 is one of the most popular and most flavorful, spicy and deep fried lip smacking chicken dish available in almost all South Indian restaurants. First trail of chicken 65 at home was by my mother. She got the recipe from one of the TV show and had tried it. Her recipe was not a deep fried one but still tasted great. The recipe I am posting today is a deep fried one which I got from here. It tastes great and everyone in the family enjoyed it. Nowadays, one can find even Gobi 65, Mushroom 65 etc in restaurants for those veggie lovers. 1. Clean the chicken and add 1 tsp red chilli powder, Salt, Ajinamoto, corn flour, 2 tsp ginger -garlic paste, 1/2 tsp pepper powder and 1 egg to it. Mix well. 2. Drop these chicken pieces in medium hot oil for deep frying till they turn golden brown in color. 3. Remove it from oil when done and place it on a kitchen tissue paper. 4. Heat 2 tsp of oil in a frying pan and add 1/2 tsp of jeera . Next add curry leaves , chopped garlic cloves. Saute it for a minute. 5. Add some ginger - garlic paste. Mix well and then add about 1/2 tsp red chilli powder, cumin powder, little salt, 2 tsp of chilli vinegar and 2-3 drops of food color. Give it a mix. 6. 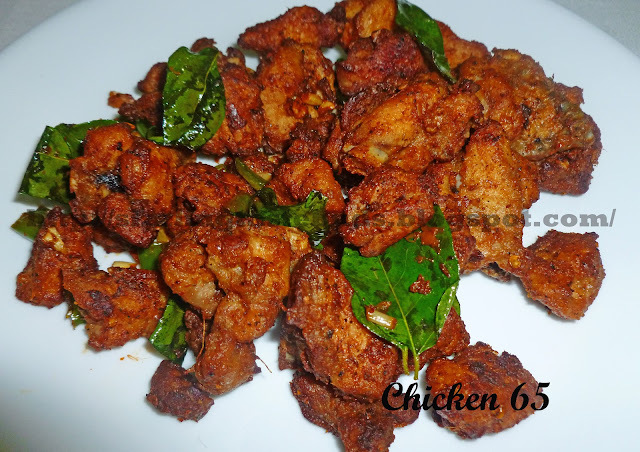 Shift fried chicken pieces into this mixture and toss it well so that the chicken pieces are neatly coated with the spices. 7. Serve hot as a starter or as a side dish to simple rice sambar or even curd rice.